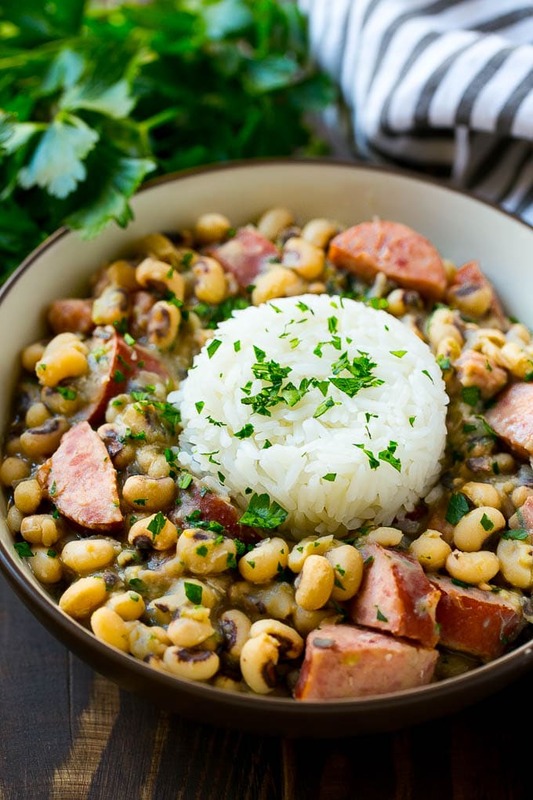 These slow cooker black eyed peas are loaded with ham, sausage and veggies. The perfect crock pot meal to get your new year off to the right start! 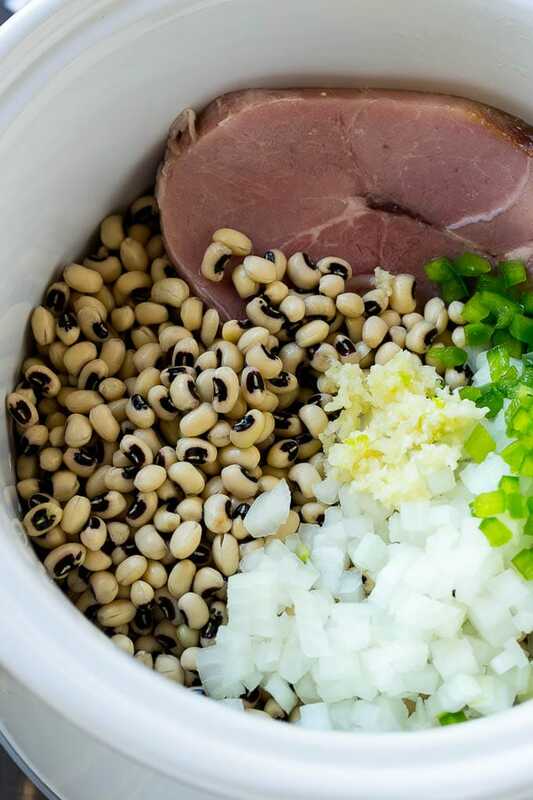 Ring in the new year the Southern way with these easy and delicious black eyed peas. They’re full of smoky meat and are absolutely amazing served over rice. 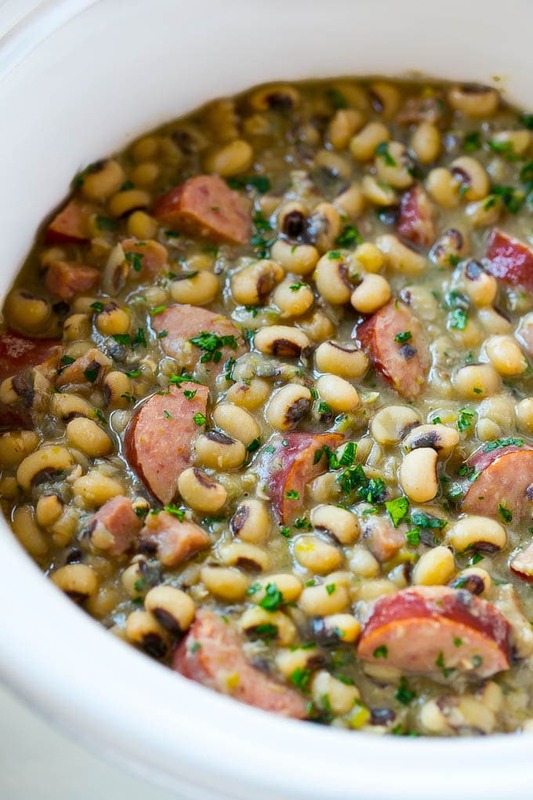 In the South, eating black eyed peas on New Year’s Day is thought to bring prosperity for the new year. Get your new year started off on the right foot with these easy (and totally delicious) slow cooker black eyed peas. They’re hearty, loaded with smoky flavor and are sure to bring you lots of luck! 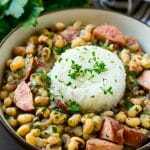 For this recipe you’ll need a bag of black eyed peas, onion, green pepper, garlic, ham and sausage. I use both a ham hock or bone and chopped ham in my crock pot black eyed peas for maximum flavor. You can save your ham bone from Christmas (toss it in the freezer!) or buy a ham hock. If you don’t have either one, simply omit and it’ll still be delicious. You’ll want to soak your black eyed peas for anywhere from 4-8 hours before you put them in the slow cooker. Soaking the peas helps them to cook faster. If you don’t have time to soak your peas, you can still make this recipe; just be aware that it might take longer to cook. The ham and sausage, and seasonings get stirred in close to the end. I add the seasoning at the end because sometimes salt can interfere with the cooking process and make the peas tough, so if you add it after the peas are mostly cooked, you avoid that issue. I use a rope style sausage like kielbasa, but if you can really use any type of smoked sausage that is available to you. You can serve these peas as-is or over steamed rice. I typically serve them with rice, but honestly they’re great as a stand alone dish too. My whole family loves these black eyed peas, even the kids! We eat them all year long, but they’re always on our New Year’s Day menu too, because who couldn’t use a little extra luck?! Place the onion, bell pepper, garlic, black eyed peas, ham bone and chicken broth in a slow cooker. Uncover and remove one cup of the peas. Mash thoroughly then return to the pot. Add the ham, sausage, salt and pepper to the pot. Stir thoroughly. Remove the ham bone. Stir in the parsley and serve with rice. This recipe was truly outstanding! Phenomenal! After enjoying this for dinner for a few nights, I changed up the flava for the remaining batch by adding tomato paste, tomato sauce and a can of Rotel (plus more garlic). Another round of incredibleness!